A solid hemisphere has a radius of length r. Let S be the number of square units, in terms of r, of the hemisphere's surface area. Let V be the number of cubic units, in terms of r, of the hemisphere's volume. What is the ratio of S to V? First, let's find the surface area of the hemisphere. Because the hemisphere is basically a full sphere cut in half, we need to find half of the surface area of a full sphere. However, because the hemisphere also has a circular base, we must then add the area of the base. The surface area of a sphere with radius r is equal to . The surface area of the base is just equal to the surface area of a circle, which is . The volume of the hemisphere is going to be half of the volume of an entire sphere. The volume for a full sphere is . Ultimately, the question asks us to find the ratio of S to V. To do this, we can write S to V as a fraction. In order to simplify this, let's multiply the numerator and denominator both by 3. Find the volume of a sphere with a radius of . Write the formula to find the volume of the sphere. Substitute the radius and solve for the volume. Six spheres have volumes that form an arithmetic sequence. The two smallest spheres have radii 4 and 6. Give the volume of the largest sphere. The radii of six spheres form an arithmetic sequence. The smallest and largest spheres have radii 10 and 30, respectively. Give the volume of the second-largest sphere. A sphere with radius fits perfectly inside of a cube so that the sides of the cube are barely touching the sphere. What is the volume of the cube that is not occupied by the sphere? Because the sides of the interior of the cube are tangent to the sphere, we know that the length of each side is equal to the diameter of the sphere. 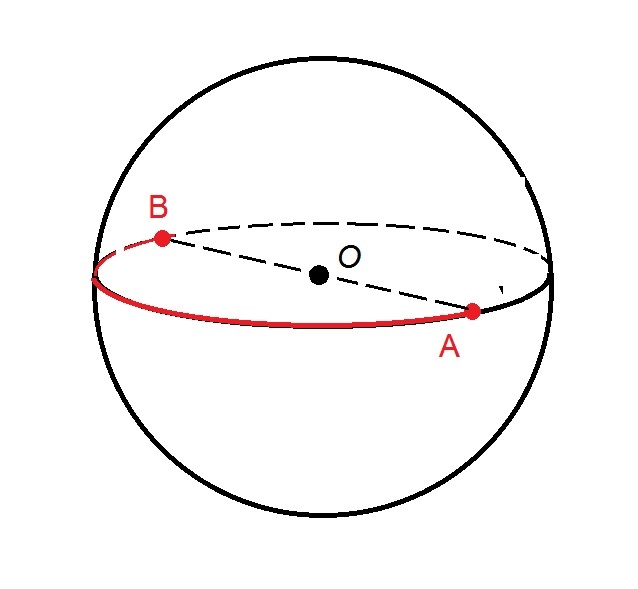 Since the radius of this sphere is , then its diameter is . To find the volume that is not occupied by the sphere, we will subtract the sphere's volume from the volume of the cube. A sphere fits inside of a cube so that its surface barely touches each side of the cube at any given time. If the volume of the box is 27 cubic centimeters, then what is the volume of the sphere? None of the given answers. If the volume of the cube is 27 cubic centimeters, then its height, width, and depth are all 3cm. Since the sphere fits perfectly in the cube, then the sphere's diameter is also 3. This means that its radius is . The surface area of a sphere is 100. Give its volume. is a point on a sphere, and is the point on the sphere farthest from . The shortest curve from to that is completely on the sphere is in length. Give the volume of the sphere. The figure referenced is below. is the center of the sphere. The shortest curve connecting to its opposite point is a semicircle. Also, is a diameter of the sphere, and and are radii. Find the volume of a sphere whose diameter is 10cm. Radius is half of the diameter. Half of 10cm is 5cm. The radius of the sphere shown here is long. What is its volume?